Our dispatchers are trained to provide the best possible customer service and all of our trucks are equipped with live GPS tracking for faster response times. When you call Wayne’s Towing Center, you will always speak with a live dispatcher 24 hours a day/7 days a week. Do you need towing Augusta GA or surrounding metropolitan area? 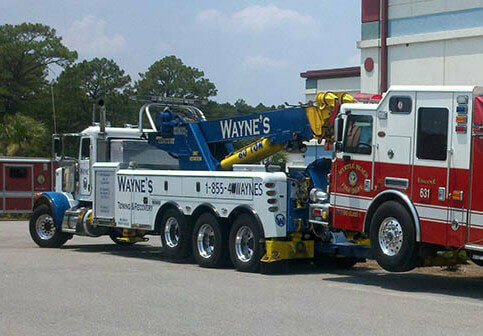 Wayne’s Towing is here for you when you need an Augusta towing company that you can count on. Our staff takes quality service and customer satisfaction seriously! Wayne’s Towing has live dispatchers 24 hours a day, 7 days a week in our local call center, we’re ready to assist you with your emergency roadside assistance or trucking needs. Plus, we ensure our drivers are well-trained and certified by the best in the industry getting both Wreckmaster Certified and HAZWOPER Certified. As a proud member of the South Carolina Towing Association, the South Carolina Trucking Association and Towing Recovery Association of Georgia, we perform all types of towing services that include light and medium towing, plus heavy and super heavy duty towing and recovery services. We have an extensive fleet of wreckers and trucks that are able to respond to the needs of mobile trucking companies. 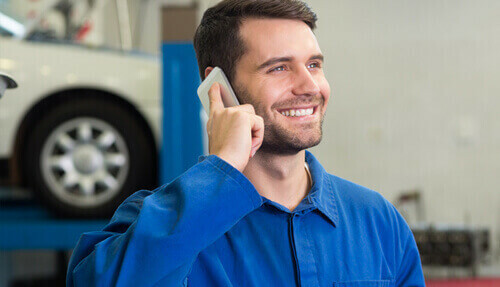 We understand the importance of your truck or fleet being out of service and the importance of having your vehicles secured quickly for repair. Big or Small We Can Haul It All! 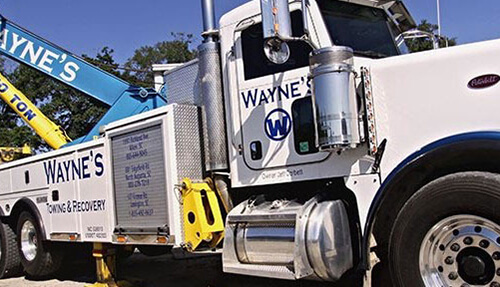 Wayne’s Towing Recovery and Transport is currently serving I-20 and I-520 with locations in Augusta GA, Aiken and North Augusta SC, as well as the Midlands area. Call us today at 706-736-4600 and we’ll get help on the way! Highly recommend. Always faster, more reasonable and professional than AAA for towing. A few months ago waited nearly 2 hours for AAA to help my wife with a battery jump... Turns out you'll be charged more for AAA roadside call than if you call Wayne's Towing. Glad we called Wayne's Towing instead. Fantastic company and our auto insurance co. works with them. Call them FIRST! These guys have always come through for me. Great people! Friendly employees and fantastic service!!! Excellent service... quick arrival and professional service!